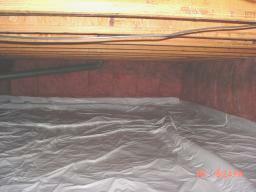 Crawlspace treatment for radon mitigation? 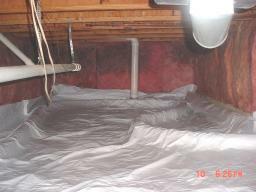 Crawlspaces have a radon collector under a radon barrier installed. The barrier is sealed with a proper sealant against clean concrete of walls and where needed individual pieces are overlapped and sealed with sealant. 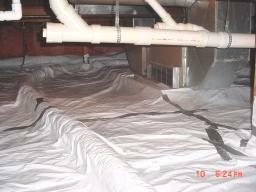 Duct tape is used only as a temporary fastener and is not the radon-seal that keeps the radon from entering the space. 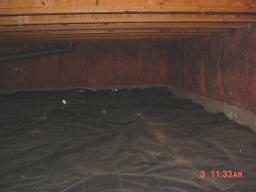 The black plastic was in the past placed by others for moisture control (and is not effective for radon removal). 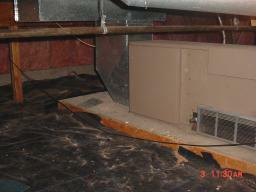 A furnace area is often found to be on a concrete pad. 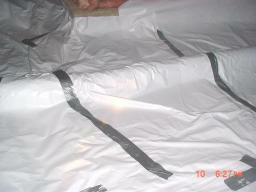 Sealing of the barier with caulk against the concrete is shown in this example:. 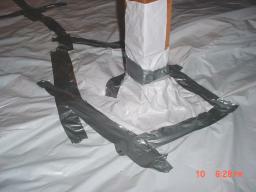 Examples of taping overlapping barrier material with duct tape, each with a seal with appropriate caulk (not visible), which prevents radon entering. In the center of this picture the collector system guides the radon into a white PVC pipe from where it is routed into the garage.